So. We’ve been busy in the lab the last few months. Really exciting. Let me explain. For a couple of years I’ve been thinking about robots with internal models. Not internal models in the classical control-theory sense, but simulation-based models; robots with a simulation of themselves and their environment inside themselves, where that environment could contain other robots or, more generally, dynamic actors. The robot would have, inside itself, a simulation of itself and the other things, including robots, in its environment. It takes a bit of getting your head round. But I’m convinced that this kind of internal model opens up all kinds of possibilities. 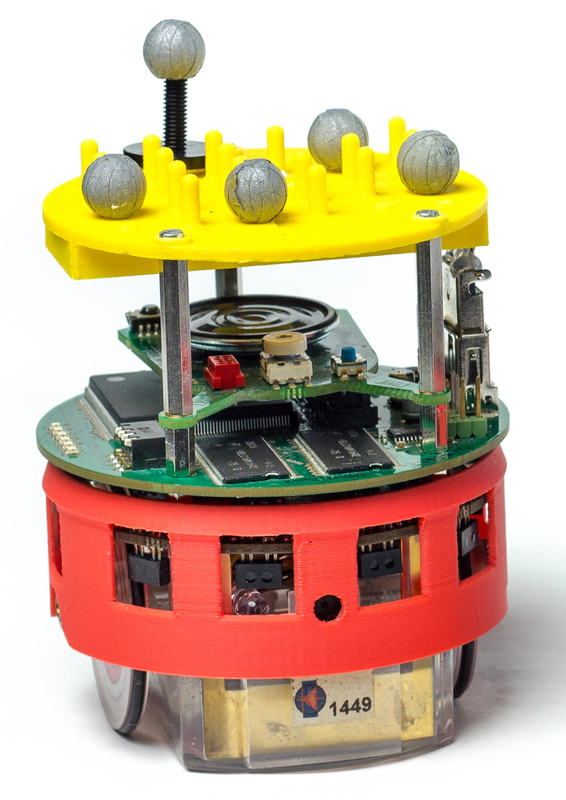 Robots that can be safe, for instance, in unknown or unpredictable environments. Robots that can be ethical. Robot that are self-aware. And robots with artificial theory of mind. I’d written and talked about these ideas but, until now, not had a chance to test them with real robots. But, between January and June the swarm robotics group was joined by Christian Blum, a PhD student from the cognitive robotics research group of the Humboldt University of Berlin. I suggested Christian work on an implementation on our e-puck robots and happily he was up for the challenge. And he succeeded. Christian, supported by my post-doc Research Fellow Wenguo, implemented what we call a Consequence Engine, running in real-time, on the e-puck robot. Here is a block diagram. The idea is that for each possible next action of the robot, it simulates what would happen if the robot were to execute that action for real. This is the loop shown on the left. Then, the consequences of each of those next possible actions are evaluated. Those actions that have ‘bad’ consequences, for either the robot or other actors in its environment, are then inhibited. This short summary hides a lot of detail. But let me elaborate on two aspects. First, what do I mean by ‘bad’? Well it depends on what capability we are trying to give the robot. If we’re making a safer robot, ‘bad’ means ‘unsafe’; if we’re trying to build an ethical robot, ‘bad’ would mean something different – think of Asimov’s laws of robotics. Or bad might simply mean ‘not allowed’ if we’re building a robot whose behaviours are constrained by standards, like ISO 13482:2014. 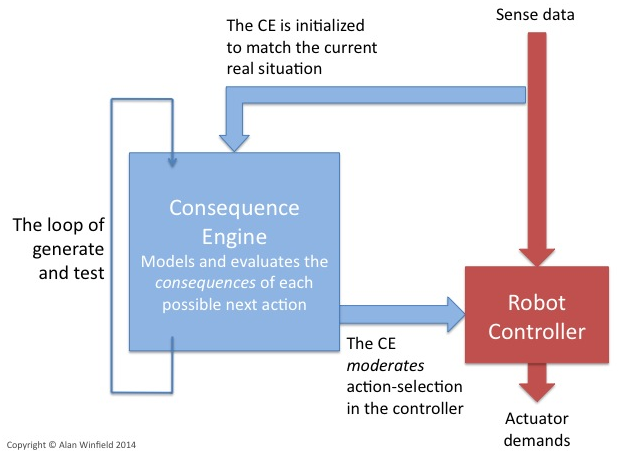 Second, notice that the consequence engine is not controlling the robot. Instead it runs in parallel. Acting as a ‘governor’, it links with the robot controller’s action selection mechanism, inhibiting those actions evaluated as somehow bad. Importantly the consequence engine doesn’t tell the robot what to do, it tells it what not to do . Running the open source 2D robot simulator Stage as its internal simulator our consequence engine runs at 2Hz, so every half a second it is able to simulate about 30 next possible actions and their consequences. The simulation budget allows us to simulate ahead around 70cm of motion for each of those next possible actions. In fact Stage is actually running on a laptop, linked to the robot over the fast WiFi LAN. But logically it is inside the robot. What’s important here is the proof of principle. Dan Dennett, in his remarkable book Darwin’s Dangerous Idea, describes the Tower of Generate-and-Test; a conceptual model for the evolution of intelligence that has become known as Dennett’s Tower. Darwinian creatures have only natural selection as the generate and test mechanism, so mutation and selection is the only way that Darwinian creatures can adapt – individuals cannot. Skinnerian creatures can learn but only by literally generating and testing all different possible actions then reinforcing the successful behaviour (which is ok providing you don’t get eaten while testing a bad course of action). In my next blog post, I’ll outline some of our experimental results.